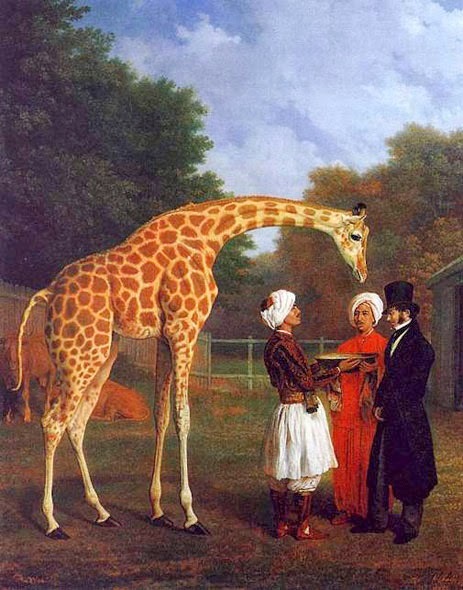 A giraffe walking through the streets of Paris in 1827 must have been a wondrous sight. What was this strange horned, half horse, half camel creature with impossibly long legs and a black tongue? Not just Paris but the whole of France was agog. Giraffes go way back in history. San people recorded them in their rock art and during the reign of Queen Hatshepsut in the 15th century BC, giraffes were brought back from the Land of Punt and there are paintings of them in her mortuary temple. In Egyptian hieroglyphics, the symbol of a giraffe stands for ‘to predict or foretell’. The actual word giraffe comes from the Arab word ‘xirapha’ which means ‘one that walks swiftly’. But the Paris giraffe was only the second to have ever been seen in Europe. The first had been a gift to the Lorenzo de Medici in 1486. When Napoleon conquered the Mamelukes at the Battle of the Pyramids, he brought his corp des savants ­– a group of 154 scientists – to investigate Egypt’s relics and so began France’s fascination with Egypt. 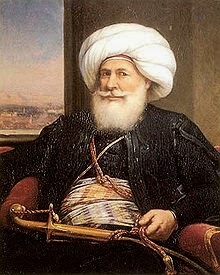 After Napoleon’s defeat at Waterloo, Muhammad Ali, became the Ottoman Viceroy of Egypt and the Sudan. He was a ruthless ruler, a slave dealer and a contradictory force – a man who cared nothing for Egypt’s antiquities but continually courted France for her western expertise and learning. 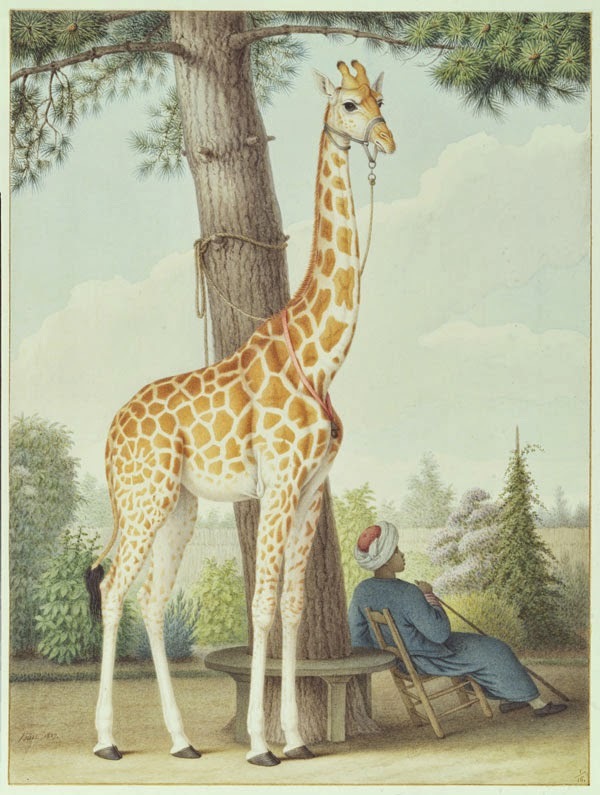 It was the entrepreneurial talents of the French consul general in Cairo at the time – an Italian by the name of Bernardino Drovetti – that brought the giraffe to Paris. Drovetti was a tomb raider and antiques dealer who helped assemble the collections of Egyptian artefacts that are still on display in museums across Europe. In addition, he dealt in exotic animals ­–Arabian stallions, Nubian sheep as well as shells and fossils from the Libyan desert. 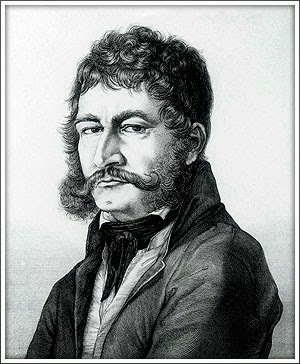 He was an expert at turning royal gratitude to his own advantage and as the confidante of the Pasha Muhammad Ali, when the new French king, Charles X, ascended to the throne in September 1824, he spotted an opportunity. Muhammad Ali had been engaged in an aggressive expansion, attacking Cyprus and threatening Greece. The exotic gift of a giraffe would charm the French public and reassure the King about the Pasha's amicable intentions towards France. The journey of the giraffe, starting with her capture in the Sudan, the 2000 mile trip down the Nile from Khartoum to Alexandria, the three week sail across the Mediterranean Sea and finally the 550 mile walk from Marseilles to Paris accompanied by two milk cows to provide her with milk, took two and a half years. By the time she arrived in Paris, she stood four metres tall. The year was 1827. She lived with her keeper, Atir, in a building called la Rotonde in what was then known as Jardin du Roi later renamed the Jardin des Plantes. Atir slept high up on a specially built platform close to her face and never left her side. Zeraffa’s fate was very different to that of Marius the giraffe in a Copenhagen zoo – as twelve years later a second young female giraffe was transported down the Nile and sent to Paris to keep her company. 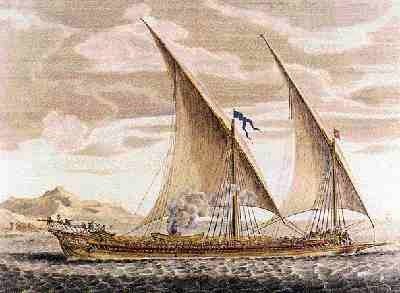 And when Zeraffa died of old age on January 12th 1845 after living in Paris for 18 years, Atir was still at her side. After her death she stood on display in the foyer of the museum at the Jardin des Plantes and was then sent to Le Musée Lafaille in La Rochelle. Today if you visit this museum you will find her peering down inquisitively from the landing of some stone stairs. She’s there with a collection of other African animals that might have browsed on the same African plains with her in an earlier life. The buildings of La Rotonde still stand in the Jardin des Plantes today. 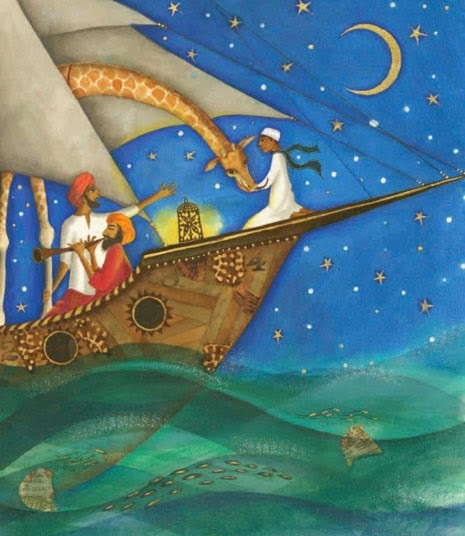 And while I was writing my picture book ZERAFFA GIRAFFA, I went there and tried to imagine the giraffe with the young Atir in their very foreign environment. What was it like for a young boy who had never been further than Khartoum to be so alone in a strange city in Europe in 1827? What would it be like even today? If you visit La Rotonde on a quiet day, close your eyes and perhaps you’ll feel the hot wind of Africa and imagine yourself standing there with Zeraffa and her keeper Atir, while he whispers stories to her of a land far away. 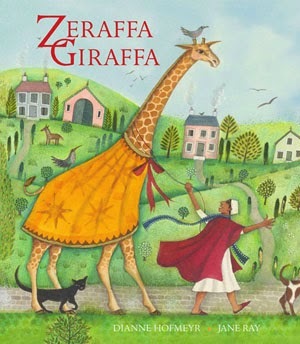 For a taste of history for young readers, ZERAFFA GIRAFFA published by Frances Lincoln, is out on 3rd April. Jane Ray’s exquisite illustrations capture the long travaille through the Egyptian desert, the voyage across the Mediterranean, the walk through the French countryside… one wonders if Zeraffa nibbled cherries or peeped through the high windows of the ‘silk’ houses as she walked through the Luberon valley and then along the Rhone… until she finally reached the streets of Paris. Brilliant--delightful. Oh, I do love this post. I'm sending it off to several friends right now! This sounds great! Will order it for grandchildren (and for me...) And such a relief Zeraffa's journey didn't end badly! Thank you Ms... good to know it will be going around the States but you must all be asleep by now. And also to you Sue... hope grandchildren enjoy and for the review to come Adele, many thanks! What a brilliant title for a book Dianne! It's enchanting and the illustrations are exquisite. It such a different story for children - equal to the very best of folk tales. Definitely on my gift list. Love that Atir always slept close to her face! Brilliant post, Di! Can't wait for the book. such a lovely post. Thank you, Dianne. Gosh Drovetti looks like a serious Villain! I do feel sorry for the poor giraffe having to walk so far. Shall order your book tout de suite, Dianne!